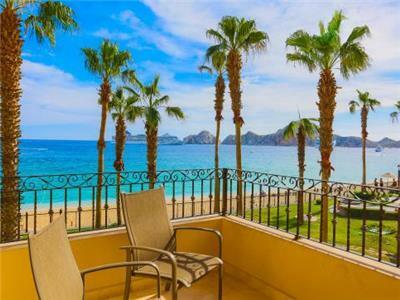 A luxurious beach house in the sky, the Pueblo Bonito Penthouse commands stunning views of the Cabo San Lucas Bay and the famous arch at Land's End. One of the most superb resort properties in Los Cabos, Pueblo Bonito Blanco sits right on famous Medano Beach with direct access to sun, sand and surf, along with the many activities available in the bay : sunset cruises, sport fishing, scuba diving, kayaking, parasailing, all right at your doorstep. Inside the penthouse, large sliding glass doors let sunshine and cool ocean breezes flow through this lovely home. Floors are covered in exquisite Carrara marble and walls are neutral-toned, giving the space a bright and spacious feel. Hints of blue in the decor, along with delicate sea stars, shells, coral and sea glass decorating the tabletops and walls create a beach house vibe throughout the penthouse. Common areas include a comfy living room with sofa seating around the big flat screen TV, a full-sized kitchen with granite countertops, stainless steel appliances and small breakfast bar, as well as a large formal dining space with views of Land's End, offering a gorgeous setting for an unforgettable meal with family and friends. Combining comfort, elegance and natural beauty every bedroom features luxe linens, beautiful decor and stunning views of sea and sky. One room includes two double beds and an ocean view, and the two master suites offer plush King Beds and indulgent ensuite baths. Like a private spa in the penthouse one bath has an intricate Greek key tile pattern adorning the wall, and stained glass windows with waves of teal and aqua frame the jet tub inset into a teak platform. The other baths include large soaker tubs, double sinks, and walls and floors bathed in marble and shimmery blue tile. Fragrant bougainvillea fringes the penthouse's magnificent terrace. There are several cushioned teak recliners for lounging in the warm Baja sunshine, as well as two casual outdoor seating areas- perfect for sipping cocktails in the afternoon and taking in the endless ocean views. A massive Jacuzzi bubbles away at the edge of terrace overlooking the beach, the bay and the spectacular Land's End arch. Guests staying at the Pueblo Bonito Penthouse will enjoy all the perks and amenities of this renowned 4-star resort : 24-hour front desk service, on-site concierge, business center, shuttle bus, family-friendly atmosphere that includes a Kid's Club activity group, large free-form swimming pool with an adjacent bar and grill, and two restaurants that feature Mexican specialties, fresh seafood and amazing ocean views. Relax in your own private paradise in the sky at the Pueblo Bonito Penthouse. 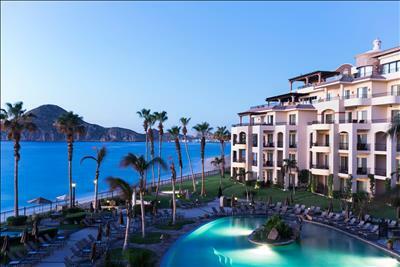 Luxurious Medano Beach Oceanfront - 2nd Floor Two Bedrooms - Lands End & Bay Views!